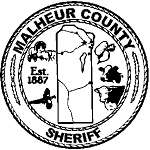 The first Jail was commisioned in Malheur County on Thursday, April 18, 1887, and was completed on or about July 8, 1887. The original jail was a two-cell jail built by the Pauly Jail Building and Manufacturing Co. of St. Louis, Mo. The original cost was five thousand dollars to be paid in gold coin. The current jail is under the direction of the sixteenth Sheriff of the County, Sheriff Brian E. Wolfe, and is commanded by Lt. Rachel Reyna, who leads the twenty-two deputies and support staff needed to supervise and maintain a 24 hour corrections facility. It is located close to the original site and is connected to the one it replaced in 1996. The current jail is capable of holding 104 prisoners and was designed to meet the needs of jails in the twenty first century. The current jail had a cost of four million dollars to complete. The staffing of the jail is comprised of 3 sergeants, 12 deputies, 5 law technicians and a food service director. A contracted physician, in addition to two full-time nurses provide inmate medical service weekly. Click here for more Jail information.